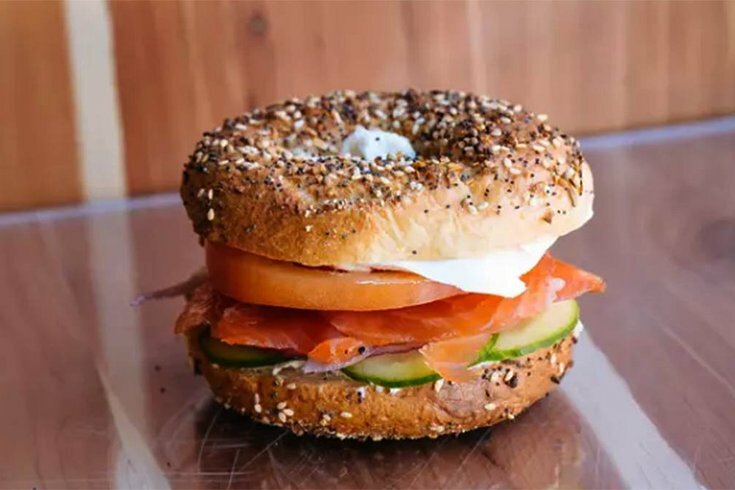 The Classic Lox Sandwich – cream cheese, cured salmon, cucumber, tomato and red onion – from Philly Style Bagels in Fishtown. You can have one delivered at www.trycaviar.com. The owners of a popular bagel shop in the Fishtown section of Philadelphia are sharing some of their secrets to success. Earlier this month, Philly Style Bagels' Classic Lox Sandwich earned the No. 1 spot on Bon Appétit magazine’s “The 5 Best New Sandwiches in America” list. The shop beat out eateries from New York, Chicago, Pittsburgh and Dallas for the honors. In the video, Zilber credits Philly for help making the shop a possibility. "It's a really exciting time to be in Philadelphia, where you can still afford to come in and start a 600 square foot bagel shop," Zilber said. "Where, if we were trying to do that in San Francisco, or L.A. or New York, that ship has sailed. Can't do that anymore. And the dream is still alive in Philly, you know?" Philly Style Bagels opened its doors in January and has already surpassed its original goal "to make the best bagels in the City of Philadelphia."